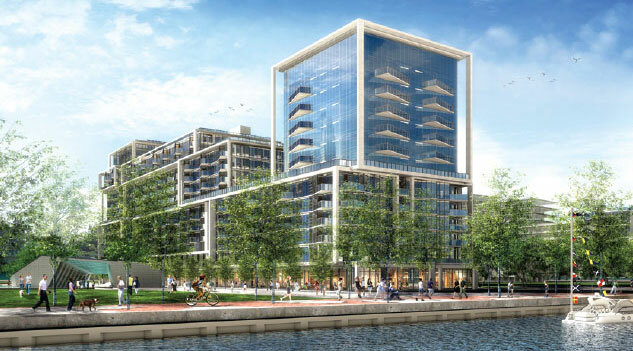 Master developer Hines, an international name on the real estate scene, has joined forces with Tridel, Canada’s leading condominium developer to create Aqualina Condominiums, a magnificent Waterfront Project located South of Queens Quay just east of Lower Sherbourne. This vibrant new neighbourhood represents Waterfront Toronto’s single largest revitalization endeavour to date along the city’s waterfront representing the first phase of Bayside. The 13 storey building will be designed in a series of stacked cubes with angled balconies To maximize the views of the lake and the cityscape. Aqualina will consist of 363 suites ranging in size from 572 square feet for a one bedroom to 1530 square feet for a two bedroom plus den. Prices are starting from the low $300,000s and completion is slated for 2016. The neighbourhood’s main street — Bonnycastle Street — will draw visitors from across the city and will provide connections to neighbouring public spaces, including Sherbourne Common, Queens Quay linear park, the Water’s Edge Promenade and future Parliament WaveDeck. Tridel has established a reputation as a leading environmentally sensitive, green residential developer and has earned several industry awards and distinctions for its Built Green approach. It has been named BILD’s Green Builder of the Year five out of the past seven years. This commitment to sustainable development is shared by Hines, who was among the earliest supporters of the Leed program in North America. Aqualina at Bayside will pursue a LEEDS Platinum designation and will be part of Toronto’s first LEED-NG Gold neighbourhood. While all buildings in Bayside Toronto will be LEED Gold Certified, Hines striving to have Aqualina certified LEED Platinum, the highest rating with the LEED Green Certification System.